With the drama surrounding the Chongqing Major reaching a boiling point, the past few days have been interesting for Dota 2. In addition to dividing pretty much the entire Dota 2 community, it has raised alarms on Valve’s hands-off approach. In particular, many have pointed out how Valve needs to develop a firm set of rules and an even stricter implementation or reinforcement of the said rules. All in all, the only way to describe the entire situation is that it’s a mess. 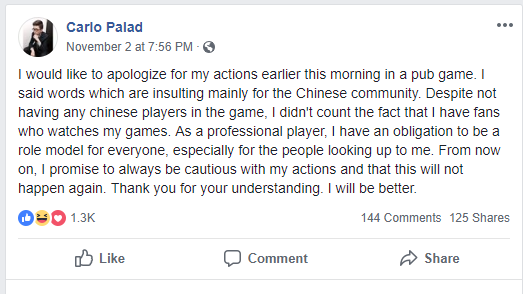 It hasn’t helped that we now have confirmation that Carlo ‘Kuku‘ Palad has no choice but to skip the Chongqing Major. Furthermore, if the ban does indeed push through, Kuku’s career is essentially in jeopardy. Lest we forget, Shanghai is set to host the next Dota 2 International tournament in August of 2019. Given that, it’s highly unlikely that Kuku will have a better chance of playing then if he is banned from participating in a LAN tournament in China right now. As a result, many important figures in the community have raised their concerns and disapproval of Valve’s silence. This includes, among others, BTS co-founder, David ‘GoDz‘ Parker; TI3 champion, as well as analyst/caster Henrik ‘AdmiralBulldog‘ Ahnberg; popular Evil Geniuses streamer Grant ‘GranDGranT‘ Harris. All three, among others, have chosen to take a stand against Valve’s silence. They all have withdrawn from the event until further notice. Below is a complete timeline of the events leading up to the drama surrounding the Chongqing Major, as well as what comes of it as the tournaments draws closer. Carlos ‘Kuku‘ Palad and Rolen Andrei Gabriel ‘Skemberlu‘ Ong are both professional Dota 2 players from the Philippines. The former currently serves as the offlaner for the Philippine-based TNC Predator. Meanwhile, the latter was the hard carry for the North American organization, compLexity Gaming. In early November, while playing at the DreamLeague Season 10 Minor LAN finals, Skemberlu wrote a racial slur in all chat while playing against the Chinese team, Royal Never Give Up. Just a few days later, Kuku would do the same, albeit in a public match in the SEA servers. These incidents quickly blew up, especially in China. As a result, thousands of Chinese would “bomb” Dota 2 with negative reviews and threatened both players. At the same time, rumors of a Chinese team refusing to scrim with TNC Predator also emerged. compLexity Gaming would then formally reprimand, fine, and eventually, bench Skemberlu from their dota 2 roster. Kuku would also apologize for his actions on Facebook and then on Weibo. However, it was later found out that the explanation on Weibo was a fabricated lie posted by TNC Predator’s manager, Jim Paulo Sy, something that he would admit himself later on. Shortly after, Valve would release a statement stating their stance against racism. In the same post, Valve clarified the kind of conduct that they expected from professional Dota 2 players. With the announcement of the Chongqing Major coming soon after the incident, many expressed concerns regarding Kuku and Skemberlu’s chances of attending the Major in China should they qualify. By late November, rumors started floating around that pretty much confirmed everybody’s fear regarding the whole situation. TNC Predator would later issue a statement and their subsequent punishment for Kuku. In the midst of it all, a twitter exchange between popular Dota 2 figure Matthew ‘Cyborgmatt‘ Bailey and compLexity Gaming’s General Manager, Kyle ‘Beef‘ Bautista, occured. In the said exchange, Beef would confirm that their decision to kick Skemberlu off of the roster was not related to the rumored pressure from the Chongqing government regarding banning Skemeberlu from attending the event. Kuku continued to play with TNC Predator at the Southeast Asian Qualifiers for the Chongqing Major. He would help his team qualify for the event. From here on out, more and more figures within the scene started voicing their concerns. In particular, many called out Valve for their silence regarding the entire ordeal. Most of them agreed that Valve should now allow any local government or tournament organizer to ban a player. Otherwise, it would set a precedent that would allow anyone other than Valve to ban players for arbitrary causes. So far, the drama surrounding the Chongqing Major is still ongoing. To date, it remains unresolved, with Valve having yet to release any formal statement. From what we can gather, only the management of TNC Predator have released any kind of formal information. According to their post on Twitter, TNC Predator had received information from the tournament organizers that Kuku is not officially banned. However, they added that the government itself may not grant him entry into China. Also, in the case that Kuku is granted entry, the post iterates that the local government may cancel the event if Kuku chooses to attend. Finally, TNC Predator also received information that the TO would not guarantee Kuku’s safety should he decided to enter China. As a result, Kuku’s ban from the event has caused many several profiles to speak out and announced their refusal to work at the Chongqing Major. This includes the three personalities already mentioned above, namely, GrandGrant, GoDz, and AdmiralBulldog. The ball, as they say, is in Valve’s court now. Their lack of policing and communicating with the community has led to situations like this happening. Valve, should, at the very least, issue a response addressing this issue. The longer they remain quiet, the more this situation festers. As it is, the community is already driving itself, with no governing body left in charge. Everyone is trying to police each other, from local governments to the talents to the orgs to the fans and other known personalities within the scene. Valve now find themselves at a crossroads where their next decision matters. Whatever their decision will cause ripples that the community will feel years from now. If they make a mistake, it could cost them their fans in the West, or in the East. Neither of these two scenarios paint a good picture for the company. Whether Valve decides to create an actual commission for Dota 2 after this remains to be seen. But, if they do, then it’s a longtime coming. After all, Dota 2 is a multi-million dollar sport. Financially, the game rakes Valve hundreds of millions of dollars in revenue every year. Hopefully, what they decide to do leaves the competitive Dota 2 scene in a better shape — not the other way around.